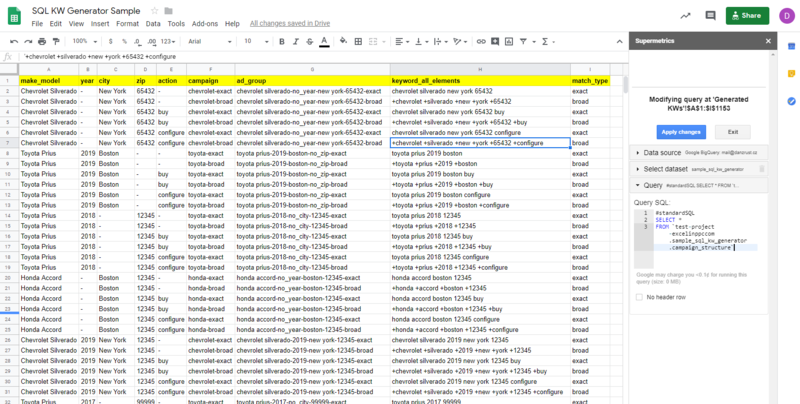 If you run massive search accounts with millions of keywords created based on templates, it can get really tricky to regularly generate such keyword lists on scale on daily basis for example. 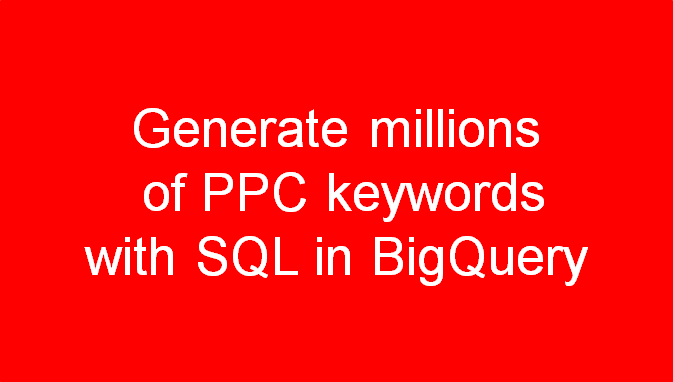 Write your keywords manually. Good luck with that. Do some copying and pasting in Excel/Google Sheets. Good luck with making no errors. Use 3rd party tool to help you out. Generally the most convenient option but you need to shell out some cash. Make your own tool 100% fitting your needs. You can use for example Power Query in Excel or level up your game and employ some SQL and that’s what I will describe in this article. And that’s it. It’s not as difficult as you might think. Assume your run campaigns for various car dealerships. 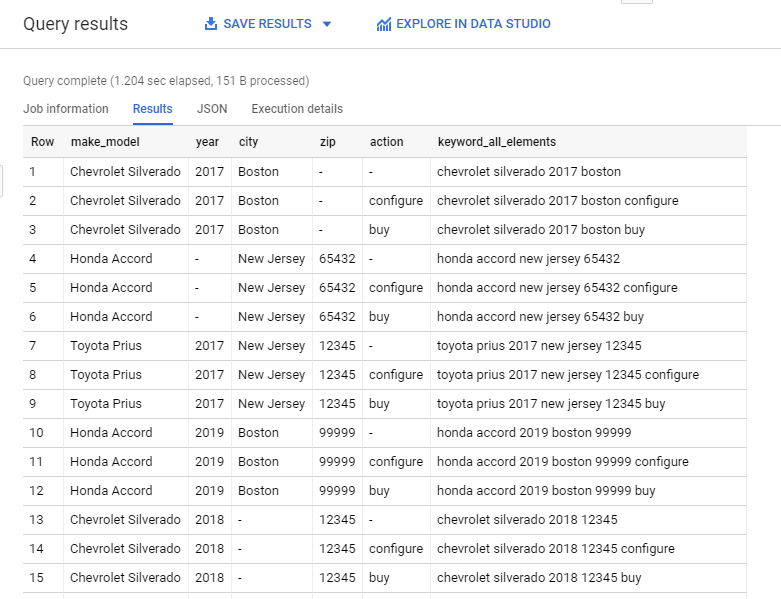 You always need to create same keywords such as “configure chevrolet silverado 2019”, “buy toyota prius 2019” for different models, manufacturers, years, cities and zip codes. 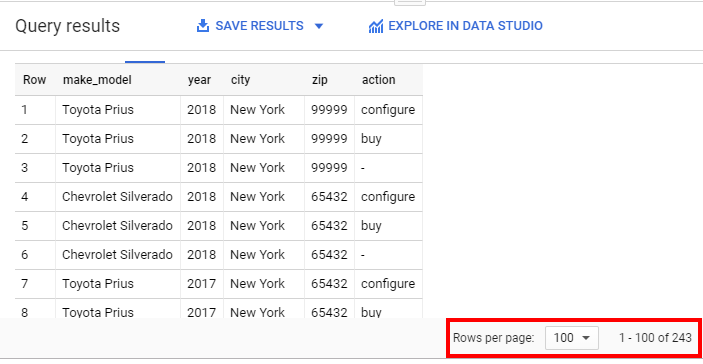 Unless you know nothing about BigQuery at this point, I strongly recommend you to start with this article. 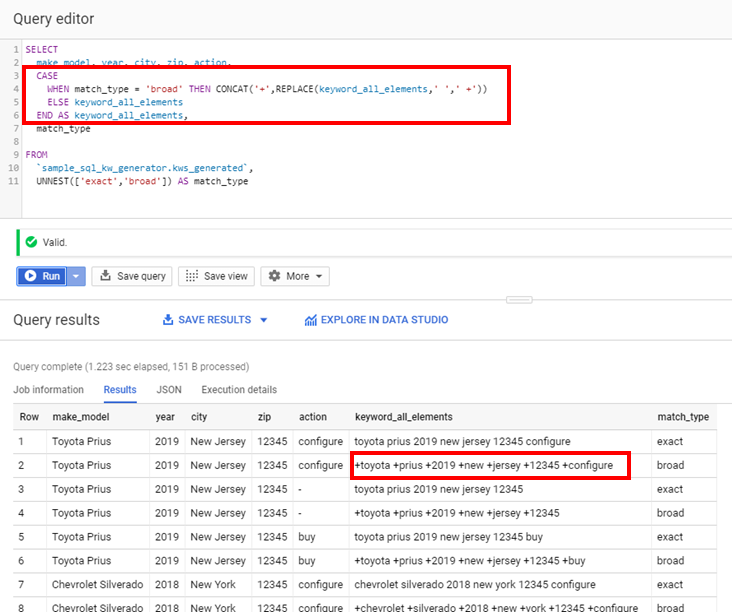 You will get an idea about what BigQuery is, what it can do and how to actually start using it. 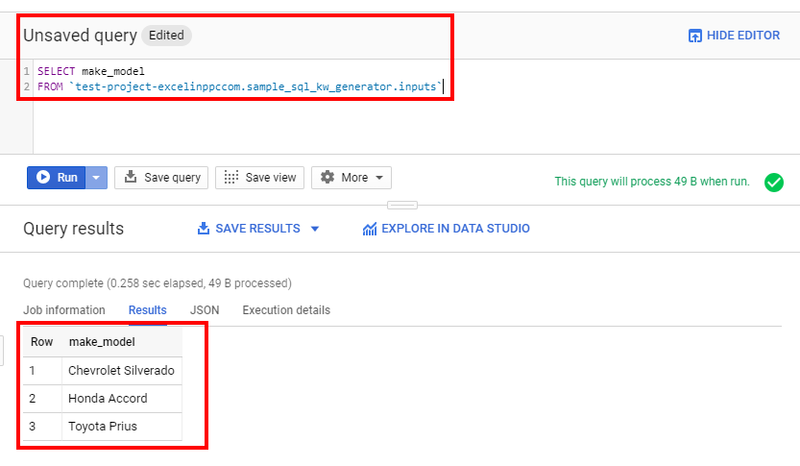 So now big question is how to get your user friendly input sheet into BigQuery? Well, I have a good news for you. 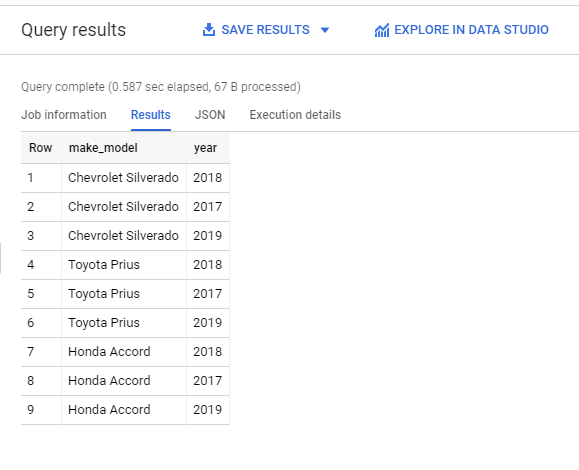 With our partner project www.MythicalReports.com, we prepared an add-on for Google Sheets called “BigQuery Uploader for Sheets”. Grab it from Chrome Web Store here. 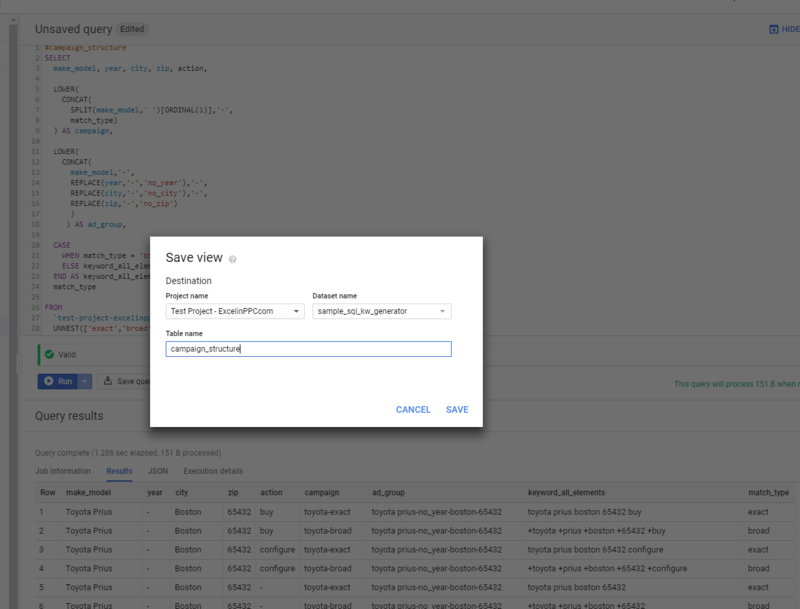 The add-on will upload the inputs from Google Sheets to BigQuery with few clicks. If you are unsure what each column means, read detailed instructions on the official add-on page here. 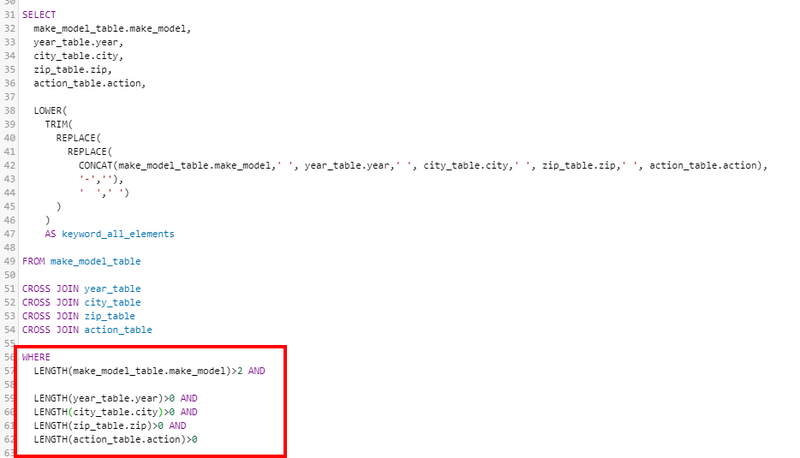 into the Query editor area and pressed “Run” button and this query returned the 3 row table with male_model column. Another important note is that you should ALWAYS include the project name in your FROM clauses. 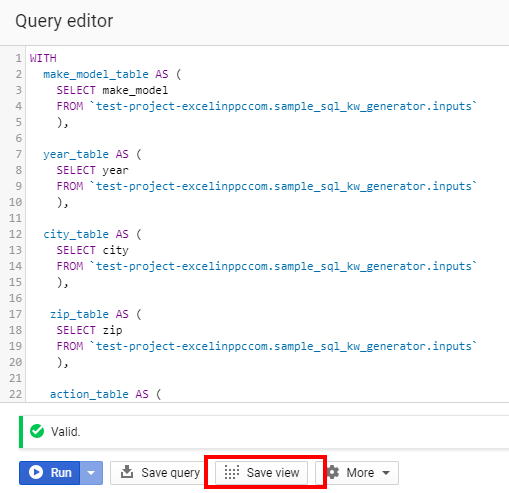 It will save you many headaches in future (e. g. saving a query as view requires the project names in FROM clause). If you want to comment out a line you start with #. If you want to comment out a block of code, you start with /* and end with */. 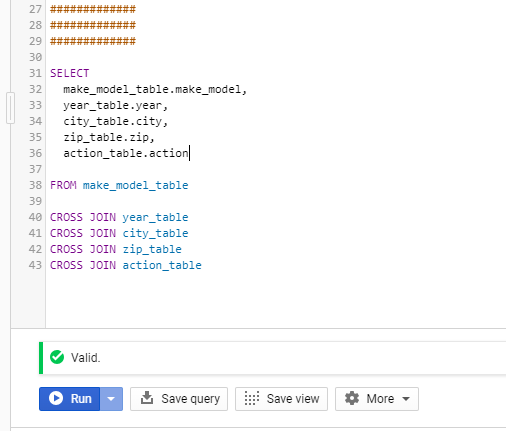 And the last note might be obvious – BigQuery does not care about spaces or tabs, so you can make your SQL look nice and readable. 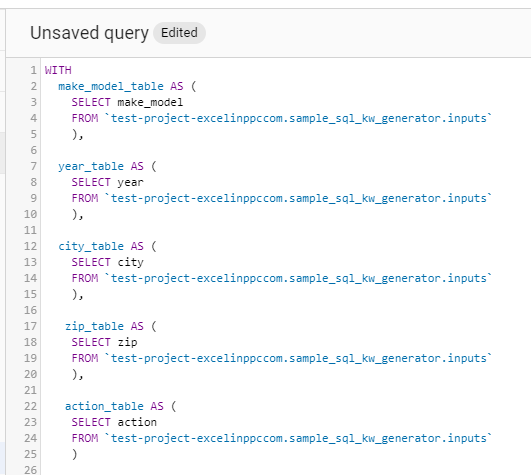 The pattern is this: WITH some_table_name AS (your query). If you are creating multiple temporary tables, you have to separate them by commas. As you can see, I have 5 tables because will be multiplying 5 columns against each other. That wasn’t too difficult, was it? You now have multiplied the make_model with year giving you all the possible combinations of make_model and year. Now you have all possible combinations generated, you just need to “make keywords” out of them. This does not look particularly nice, does it? We can see many keywords including “-“. We need to REPLACE these “unwanted” characters with “nothing” and do some replacing of triple and double spaces, trimming and lowering. 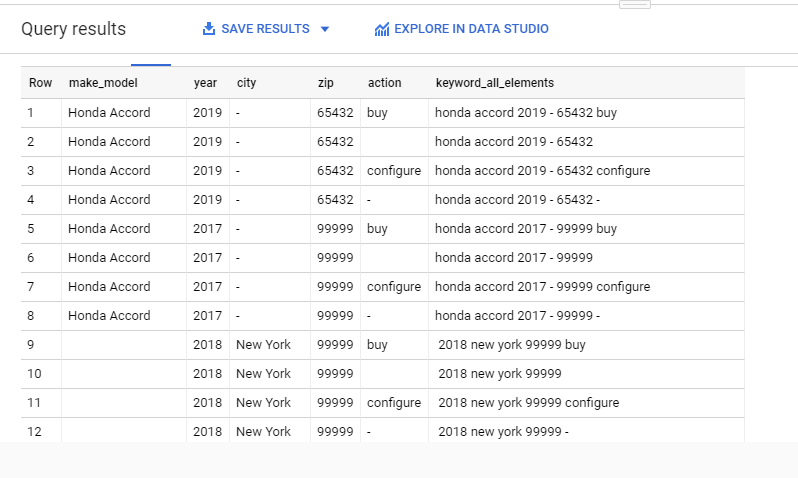 This simple move will give all the possible keyword combinations not limited to always including values from all the 5 columns. 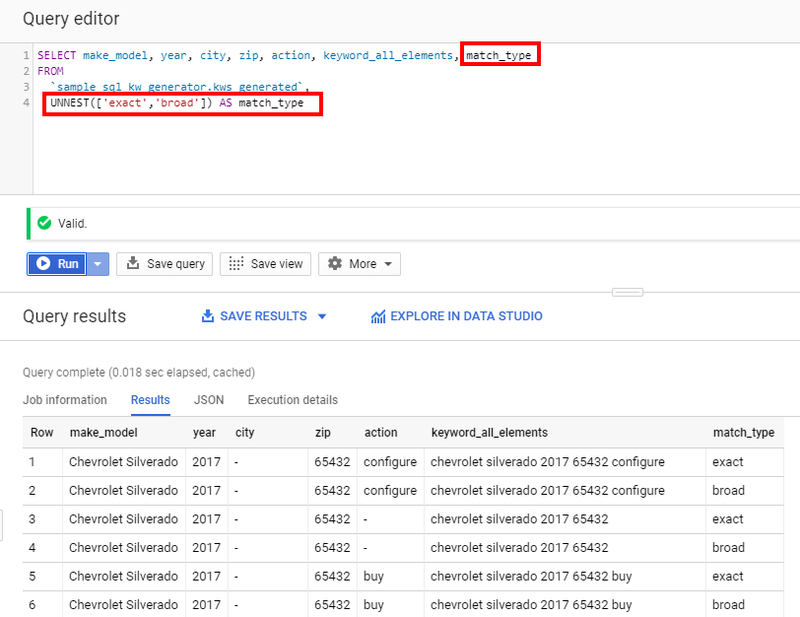 At the same time, we need to filter down only to keywords which have model_model column filled in. In the first upgrade, I am wrapping up the existing CONCAT function into 2 replace functions (dashes, triple+double spaces need to go out), then I trim the resulting string (=get rid of spaces at the beginning and end of keyword) and as final step, I convert the keyword to lower case. In the second upgrade, I filter out all rows which are shorter than 2 characters in the make_model column. This move will remove the “duplicates”, now my keyword count is 576. In my example, I am only working with broad and exact keywords. 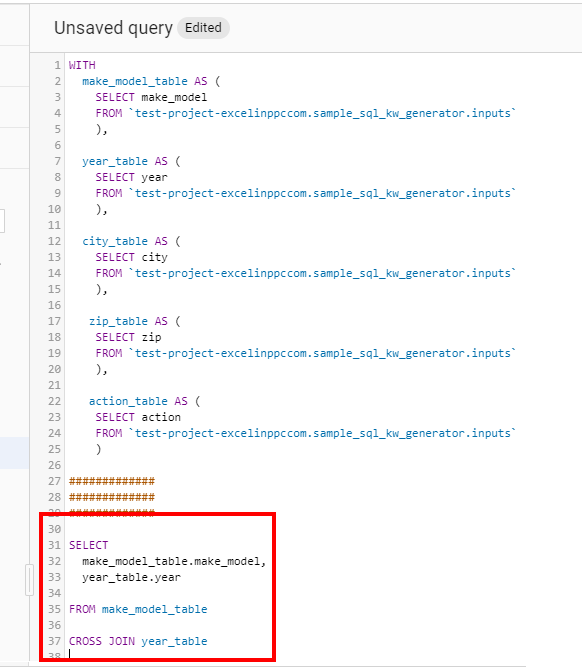 Basically, you are creating and unpivoting an array of “exact, broad” as new column at the same time. And now it’s time for creating campaigns and ad groups. 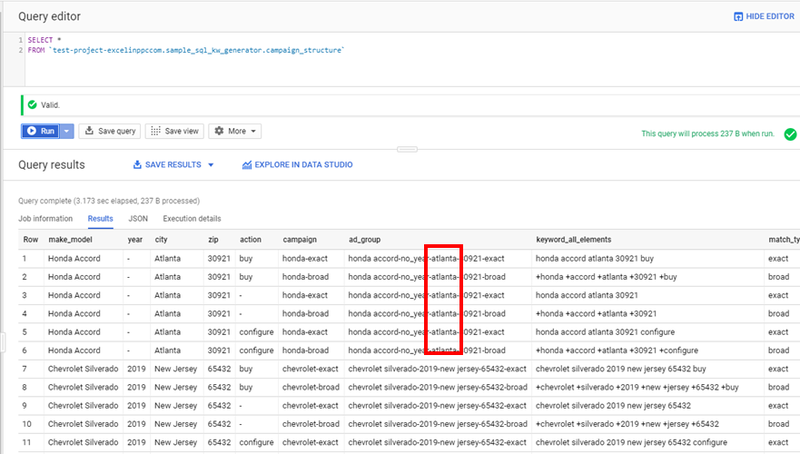 Assume you want to use the first word from the make_model column + match type as campaign. All lower case. And that’s pretty much it. In the real world, you would need some landing pages (maybe a join from a different table) and Max CPCs (probably based on some CASE statement). 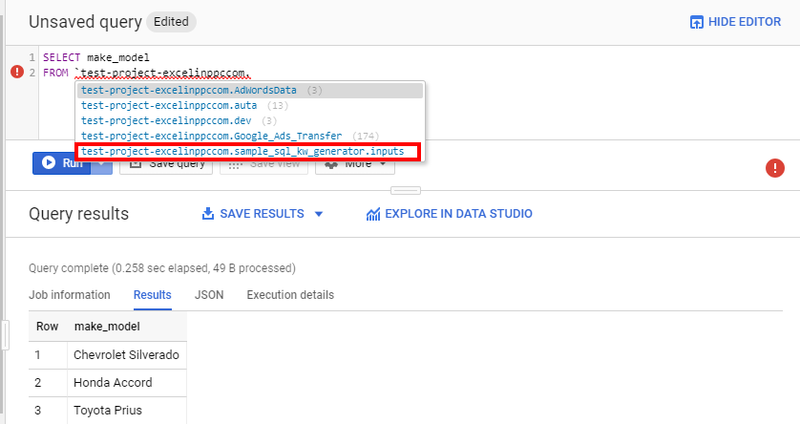 That’s where Supermetrics for Google Sheets comes in because you can use their BigQuery connector for downloading the data from BigQuery. 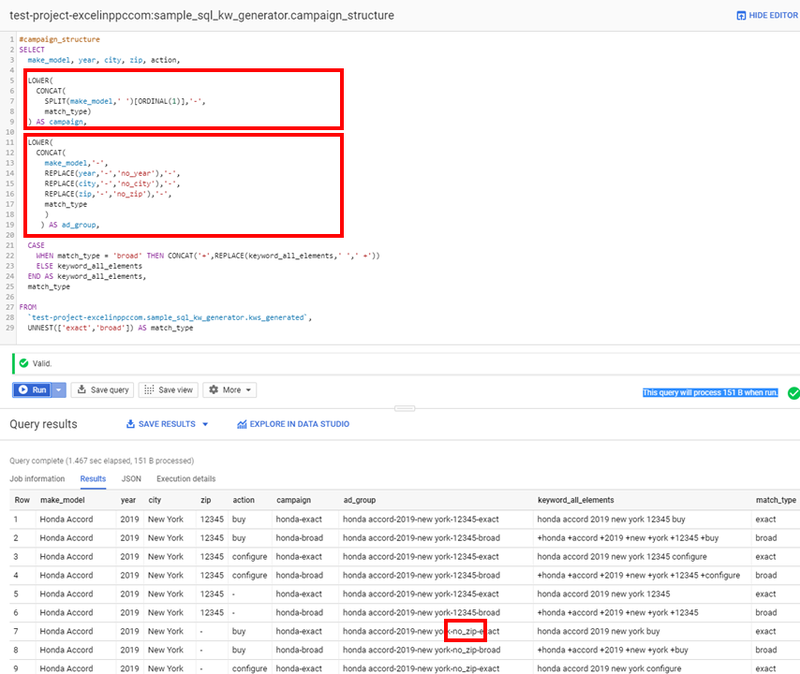 All we need to do now is to write a query to select all the columns from the “campaign_structure” view. 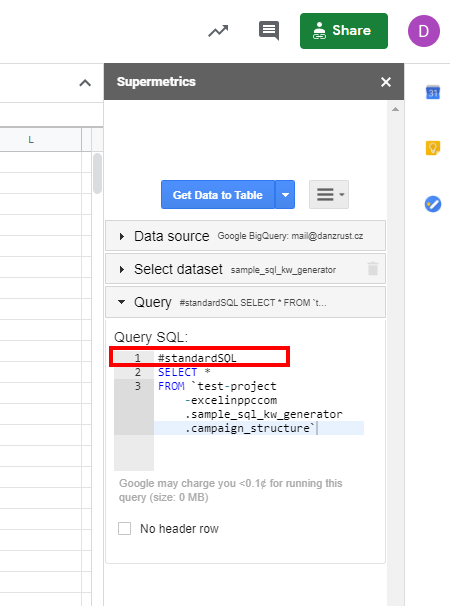 When querying the data in BigQuery through Supermetrics, you need to declare that you are using #standardSQL on the first row. The rest is just a simple select of all the columns from the final view (=campaign_structure is the final view). And that’s it, you just generated all possible combinations. You can schedule Supermetrics to run daily. However, you need to push the inputs from Google Sheets manually via our add-on. We’ll add scheduler into the add-on later on. I am aware that I am creating some unwanted combinations of cities and zips. In the real world, that SQL would be little more complicated. In order to convey the message here, I accepted some simplified concepts which make the article more understandable (I hope). 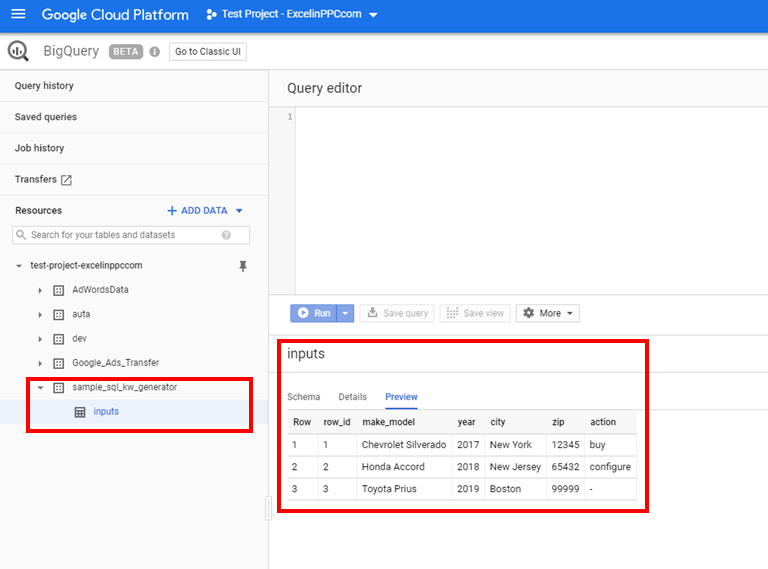 When you start working with BigQuery, you will be frequently getting errors around parentheses, commas, weird characters and so on. Don’t worry, it’s normal. After you get used to syntax, you will be OK. 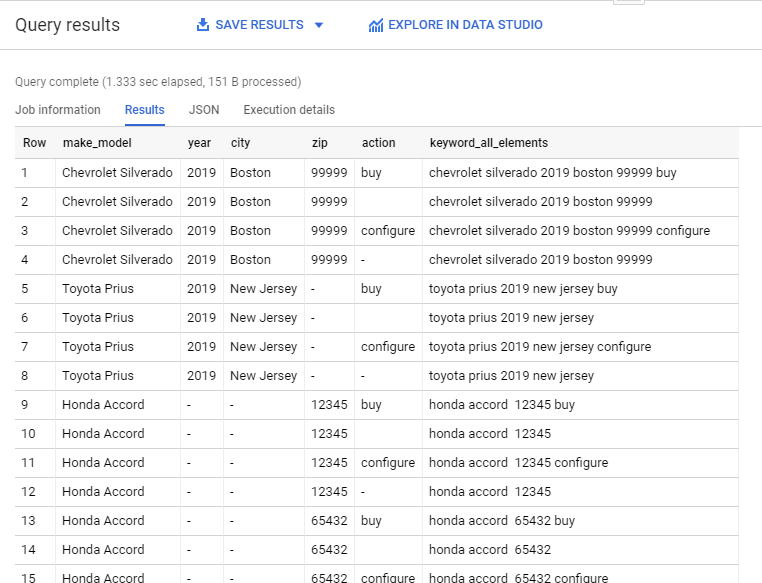 The article is ending with loading keywords into Google Sheets from where you can copy and paste the keywords and upload them through AdWords Editor, or you can have a script loading your shiny new keywords from Google Sheets to Google Ads. That’s topic for more advanced users and I may cover it in a separate article. 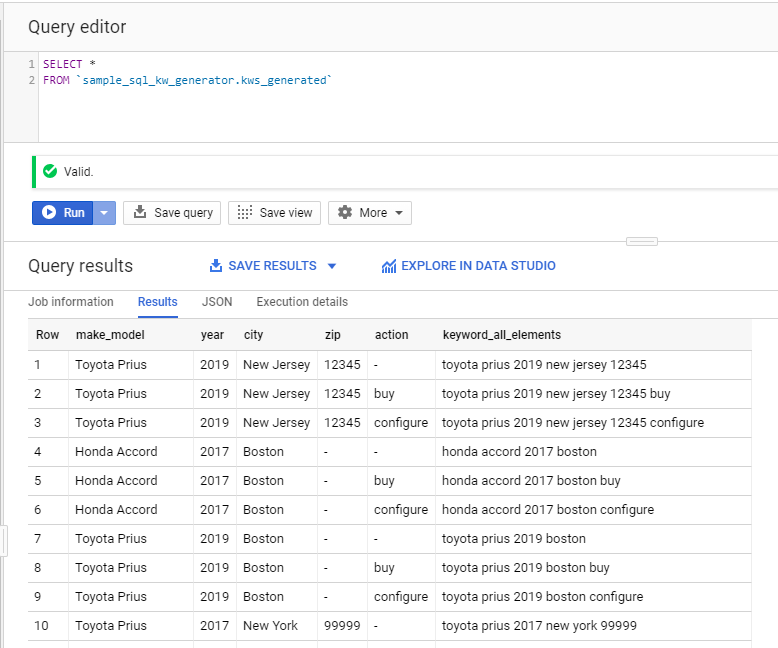 To conclude, I hope it’s now little clearer how you can use BigQuery and SQL to create thousands or millions of keywords. Yes, it’s may not be that easy at first sight, but if you dive into the topic, you can learn pretty quickly. Hi DANZRUST, this great article to read and I am going to this method. I have a few questions, if I want to use it only for keywords research then is there any way to use this free? can you be more specific what are you trying to achieve? In my article, I am creating the KWs, not doing in any sort of KW research. 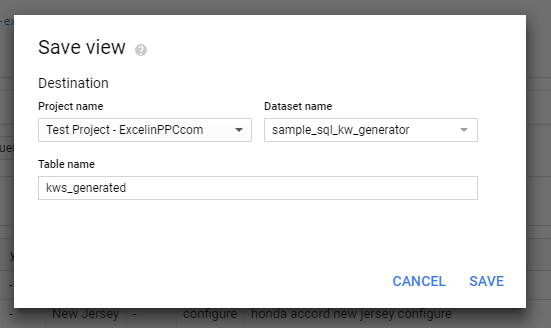 Google will not export any of the KW planner data into BigQuery natively.